Okay, is this just me or does Unit-02 look really different in Rebirth? I was watching where Asuka's confidence comes back and shes kicking major ***, and the EVA looks really odd, and differen't from I remember it looking all through the series (Mainly the episode where it premieres). It looks not as thin and gaunty, it looks rather stocky, and not very curved in shape. The color seems a bit blah too. Have I just not been paying attention to the Unit's look throughout the series much? EoE is mainly animated by studio IG, not GAINAX. The main difference is probably how they made her shoulder pylons a lot smaller in the movie - I'll let Reichu nag about the other differences. It's definitely not just you. Kyoko-sama is very oddly-drawn in Rebirth/EoE. Her regular "Eva-ish" proportions have been replaced with more "human" ones... the result being that her head looks too large, her shoulders too narrow, and her hips too wide. They also drew her helmet very oddly in some shots, and screw up the number of armor plates on the torso in others. Ah, I see. Well at least Its not just me. I'm guessing its not just me that some of the NERV personel sound like they have different voice actors, eh? Kagerou wrote: Ah, I see. Well at least Its not just me. It depends. In Japanese, no. In English, yes. At lest that is what I have heard. I have never watched EoE in English. tv33 wrote: It depends. In Japanese, no. In English, yes. Its very simple really, just click on the option that says "Japanese" for the language option. I disliked the show in English, so if I chose to watch the movie, I have no desire to sit through an hour and a half of the dub. My comrade-in-arms pretty much covered all of the bases, far as the eViLz of Gekijouban Kyoko-sama go. I'm just here to provide a few visuals. And here is her head. This is EVA-02's completely unnecessary EoE redesign. Notice how disconcertingly similar she now looks to the harpies. ...some animator in charge of half the uber-bitchfight scene decides to make her even STUPIDER looking. And you're right, Kagerou. The armor really COULD use a little spit 'n' polish. Not only that, but she slouches forward a lot more. I don't know why, but that really annoyed me. siendra wrote: Not only that, but she slouches forward a lot more. Rather like the harpies... no? the MP evas slouched in a postition that clealy made it look like they were waiting to strike (Kind of conects to the snake heads). 02 However, looked as though it was too weak to satnad up. Poor girl must not be getting enough Protein in her diet. Good thing 01 doesn't have that problem. 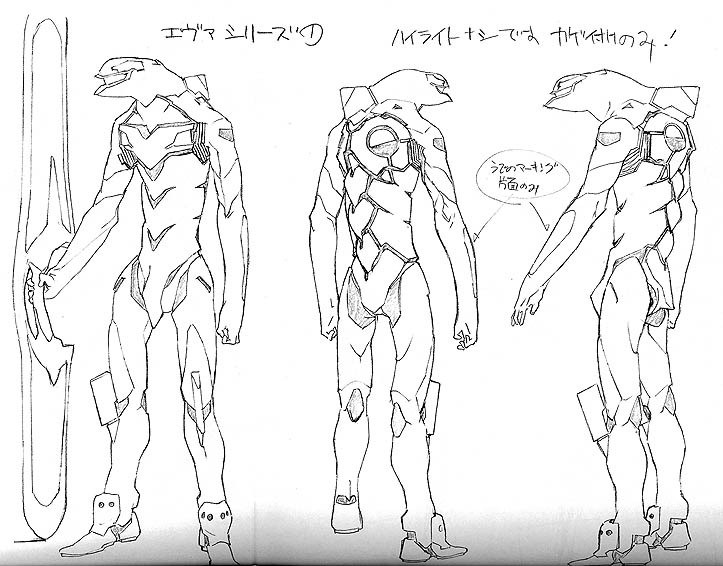 Oh well, at least Unit 01 looks relatively normal (there are still a few differences, too). tv33 wrote: Its very simple really, just click on the option that says "Japanese" for the language option. I disliked the show in English, so if I chose to watch the movie, I have no desire to sit through an hour and a half of the dub. Ya know, some dub fans dislike the new voices, too. Just saying, is all. 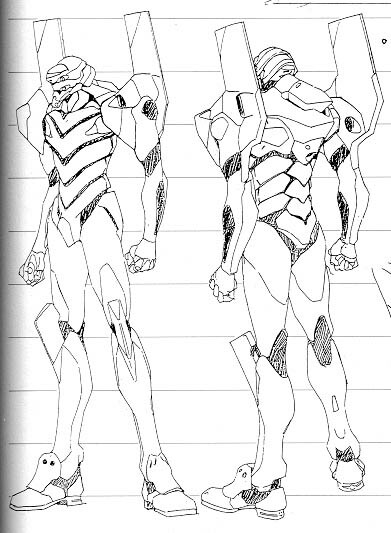 Umm....yes, EVA 02 did look different, but I never dwelt on it much. yjs wrote: I've noticed this ever since I saw the movie. Why Production I.G. did this is beyond me. I'm actually not sure if they're responsible... Takeshi Honda, one of the veterans from the TV series, is credited for designing the harpies (erm, "Eva Series"), so perhaps he is responsible for EVA-02's "new look", as well. Incidentally, Honda is the same fellow who did the artwork I posted of "Gekijouban Kyoko-sama: The Even MORE Ridiculous-Looking Version". Very, very strange. 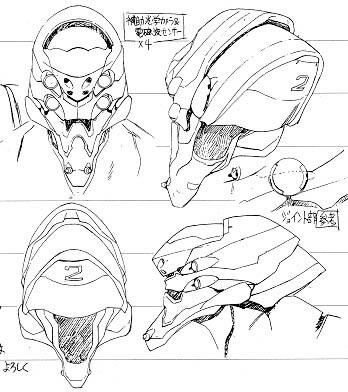 It's plain to see the original Eva-02 looked a lot cooloer than this version. 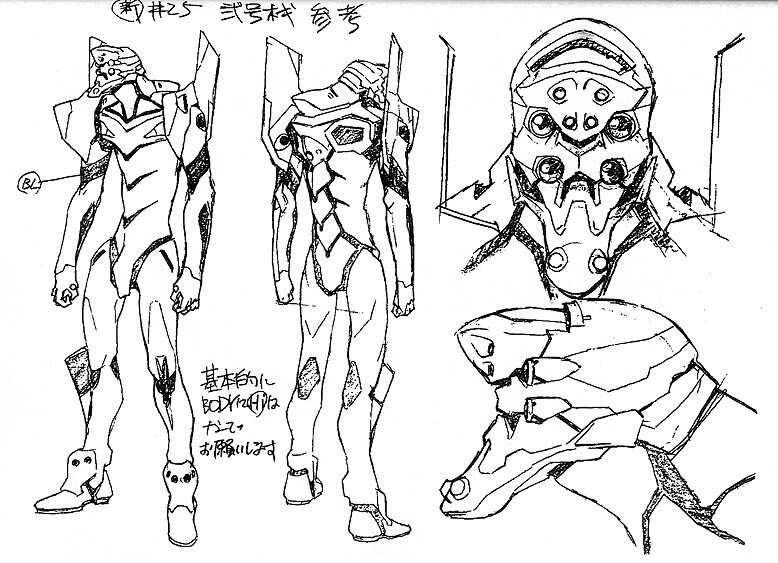 The shortened shoulder pylons and shortened lower leg really screwed up the look of Unit 02. Also notice, as has been mentioned, the complete reduction of her chest and shoulders. Kind of strange how the animators seemed to beef up her arms to compensate. In addition, the thinigies on her lower arms (don't know if those would be called "pylons", too) have mysteriously disappeared -- I suppose it might have been kind of difficult to punch straight through EVA-05 otherwise. Plus, compare the before-and-after head designs --urp. I haven't really noticed anything major besides the similar loss of the arm-bits. Yui's got four nucleolae (or mini-cores, if you prefer) instead of the two that were visible in #19, and some of the animators have a strange habit of placing her core over her sternum instead of in her solar plexus where it's supposed to be. Overall, though, EVA-01 doesn't look nearly as ridiculous as her younger sister. I think you once said it was in an attempt to make teh evas more human like. ^More like "man in a suit" like. Wow...Kyoko looked SO much cooler during the series. I actually kinda like the EoE look. Her movements seem more realistic than from the series. She looked and moved kinda robot like.